I stumbled across the Greenpeace Canada Shoppers Guide to Genetically Engineered Food and was fascinated by the huge list of food that they have compiled. The Guide is several years old but I wouldn't doubt that the majority of it is still accurate. I started to read through the list and making a mental note of everything that we use that is on the list. It is not good. In an ideal world genetically modified food would be labelled so consumers could easily make decisions on what they want to put into their bodies. But that is not our reality so if we want to avoid buying, supporting and ingesting GM Food we need to do our own research for pretty much every product we buy. Yes it takes time and energy and I can see why people get overwhelmed and just buy what they are used to. The Greenpeace Shopping Guide does a lot of the ground work for you. 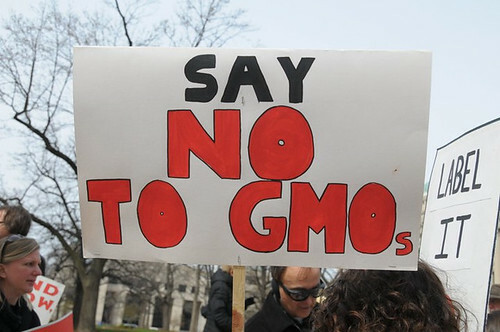 Just make a list like I did and start to eliminate the foods that are known to contain genetically modified organisms. Here is the list of things we use that I will slowly be phasing out and finding replacements for (if possible). All items marked with in Green have been completed. I am only including the items that B and I eat...not things that only Joey eats. There are 35 items on our list, of which 7 have been replaced. * Kraft Dinner - Tried Annie's Mac and Cheese but B didn't like it. How many products in the Guide do you use? Such an eye-opening post! I have a mental list I use similar to this one when out grocery shopping. Trying to avoid GM Foods over here is a minefield and can be very limiting. I know it's not always practical but I just end up making most of my own stuff (especially mac n cheese - basic roux sauce add cheese then pasta). In the UK, I wouldn't have to think twice about buying Heinz baked beans and Dairy Milk. Have you considered buying coconut oil in lieu of the organic canola oil? Love your website! I normally make my own mac n cheese too but someone is picky and only likes the boxed stuff. I haven't thought out using coconut oil because I always thought it would leave all food tasting like coconut. B didn't like Annie's pasta? Before I went all vegan, I ate Annie's pasta all through my pregnancy. Now I wish I ate cheese cause I could use some Annie's! There is an organic company called Suzie's that makes soda crackers, they are obviously more expensive but only have 3 ingredients flour, water and salt. They taste good too. Oh, how I miss Dare cookies. The chocolate fudge ones. Now I want a cookie. Rats! :) Good luck, Jen!! I don't know what is wrong with him Steph! Annie's mac and cheese is delicious! I will have to look for Suzie's crackers next time I go shopping, thanks for that tip. Dare has a plant here so it is hard to not buy their products when we can get it local but knowing that they have GMO's makes it a deal breaker now. He probably just loves the saltiness of the boxed stuff ;) Coconut oil is tricky in baking I find as it is a little heavy. I have had more luck with sunflower oil and applesauce as a substitute in cake recipes. I like to use applesauce in baking too!